Ask a cruise holiday virgin to list three things they’d expect from an at-sea getaway, and “great swimming pool” would undoubtedly find its way on to their shortlist. Since humans have sailed the seas for pleasure, swimming pools have not only provided endless enjoyment and fun, but a place to relax, unwind and occasionally make great friends. Recognising that the swimming pool is the at the heart of every ocean liner, cruise lines go to great lengths to ensure their pools are bigger and better than rival fleets. If you like nothing more than to enjoy a relaxing dip on your holidays, here are 8 of the most amazing cruise ship swimming pools where you can take a refreshing at-sea swim. If the presence of over-excited kids is enough to put you off taking the plunge, you’ll appreciate Celebrity Cruises’ blissful adults-only Solarium. With a child-free, full-sized pool flanked by a number of ever-so comfy loungers, the Solarium is the ideal place to relax, unwind and enjoy a soothing at-sea dip. Given its status as one of the most luxurious cruise lines at sea; Seabourn delivers the ultimate bathing experience, complete with whirlpools, hot tubs, massage fountains and heated swimming pools. One of the most remarkable things about Seabourn is that they’re happy to serve guests just about anything from the food and drink menu as they lounge by the pool — so there’s no need to get dressed to enjoy a decadent cocktail or two. On the opposite end of the spectrum; Norwegian Cruise Line have developed their swimming pools to be as fun-loving and child-friendly as possible — from the dancing water fountains to the 200-foot long slide, Epic. Of course, there’s also an adults only area where you can enjoy a quiet paddle, but we doubt you’ll want to spend much time there when you see how much fun the kids are having. Placing the pool area at the very heart of all their vessels, Azamara Club Cruises’ pools are built to impress, and often feature two large whirlpools overlooking a sizeable pool and sun terrace. During an Azamara cruise, numerous evening events take place beside the pool, from special poolside buffets to alcohol-fuelled celebrations and parties. Putting fun and enjoyment into every aspect of their ships; it’s small wonder Royal Caribbean’s swimming pools are some of the most entertaining at sea. 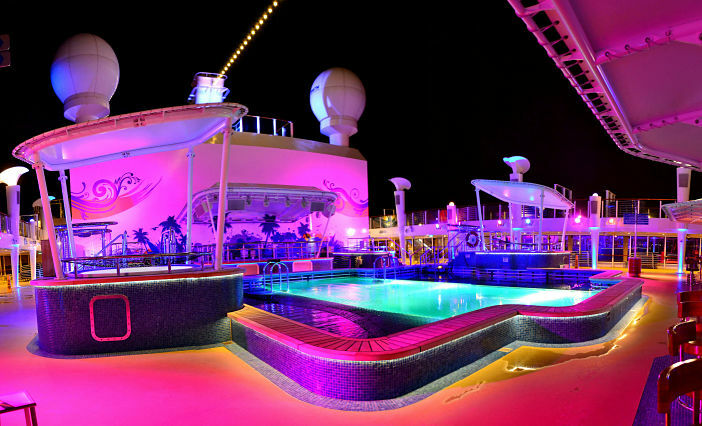 Each ship boasts two or more expansive pools, as well as the pioneering FlowRider — a 40-foot surf simulator that lets passengers hang-ten from the safety and comfort of the top deck. If you think swimming should soothe body and mind, Holland America Line could well be the cruise line for you. Delivering a wholly different swimming experience, Holland America Line offer a Thermal Suite package, which gives guests access to a special therapeutic hydro-pool chock-a-block with seawater and minerals which are great for the skin. Book a cruise with Princess Cruises, and guests can look forward to a tremendously relaxing dip in the adults-only ‘Retreat Pool’. Flanked by a series of fabric-covered cabanas where passengers can enjoy wine, antipasti and pizza, the Retreat Pool is the perfect place to while away the hours away from your boisterous offspring. MSC Cruises have arguably outdone the competition in every sense of the word with their beautiful, Zen-inspired Garden Pool. This adults-only haven features a minimalist design and elegant sculptures which emit a cornucopia of sounds from nature. The pool itself has an infinity edge, which creates the illusion of having no sides and seems to blend the pool with the ocean below. If you think swimming pools and summer holidays go hand in hand, a cruise could be the perfect choice for you. To browse a complete range of upcoming cruise breaks, visit the Cruise1st Australia website or call us on 1300 857 345. Images sourced via Flickr Creative Commons. Credit: Tom Mascardo, Kevin Hale, cheri lucas, Robert Pittman. Thank you for your enquiry. Daniel our cruise consultant would be more than happy to assist you in looking after your cruise holiday enquiry. Please email Daniel at Daniel.Leibman@Cruise1st.com.au or call him direct, 028488266 with your details.